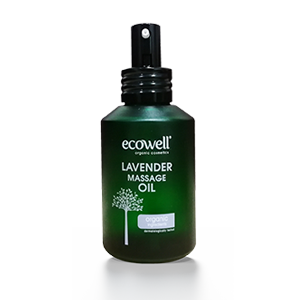 Ecowell’s Lavender Massage Oil is a soothing organic oil which promotes relaxation for the body and mind. Its natural scent is calming and creates a sense of utter tranquillity and serene balance. It pampers your skin and reduces feelings of stress, anxiety and depression. It also contains deep-healing properties to alleviate sore muscles, acne, eczema and even sinusitis. The Gentle Touch of Pure Serenity and Calm. i. Induces sleep. Sleep quality is improved significantly in addition to helping alleviate insomnia. ii. Calming scent makes it an effective tonic for the nerves and anxiety issues. It helps in treating migraines, headaches, depression, nervous tension and emotional stress. iii. Removes nervous exhaustion and restlessness while also increasing mental activity. Significantly decreases in mental stress and anxiety, as well as increased cognitive function. i. Inhibits the bacteria that causes acne and reduces the signs of scarring. ii. It has antiseptic and antifungal properties and is used to treat various skin disorders such as acne, wrinkles, psoriasis, and other inflammatory conditions. iii. It is commonly used to speed up the healing process of wounds, cuts, burns, and sunburns because it improves the formation of scar tissues. Lavender oil is also added to chamomile to treat eczema. i. Remedies various types of pains including those caused by sore and tense muscles, muscular aches, rheumatism, sprains, backache, lumbago as well as relief from pain in the joints. i. Used in the form of vapour or applied on the neck, chest and back, it alleviates respiratory problems including throat infections, flu, cough, cold, asthma, sinus congestion, bronchitis, whooping cough, laryngitis, and tonsillitis. Its vapour also has antibacterial qualities which can combat respiratory tract infections. i. 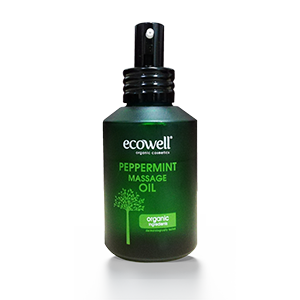 Improves blood circulation and also lowers blood pressure; alleviating hypertension resulting in organs increasing their levels of oxygenation, promoting muscle strength and health. Boosts brain activity and keeps skin bright and flushed. ii. Provides resistance to a variety of diseases due to its antibacterial and antiviral qualities. An exclusive range of certified organic massage oils for a truly sensuous and unforgettable spa experience. 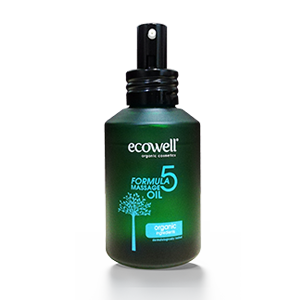 Ecowell’s Massage Oils contain Organic Jojoba Oil and Organic Sesame Oil as its bases which are highly absorbent and absolutely ideal for sensitive skin without leaving any residue. We carefully selected these luxuriant, premium base oils as they are nutrient-rich skin foods with a host of benefits ranging from improving blood circulation to leaving your skin healthier, moisturised, younger and detoxified.